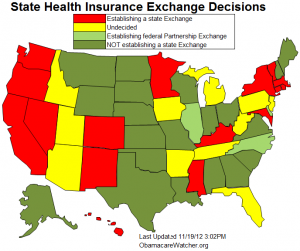 ARRA News Service: ObamaCare Exchanges Are NOT A Done Deal! Our Partners at Americans For Limited Government are tracking updates as they occur. - 20 States NOT establishing a State Exchange - This includes Florida. Note on FL: Florida Gov. Rick Scott Ready To Negotiate State Exchange Kaiser Health News (November 16, 2012). - 3 States opting to establish a federal “partnership” Exchange. - Presently, only 16 States plan to establish a State Exchange. Tags: Obamacare, states, status, health insurance exchanges, Florida To share or post to your site, click on "Post Link". Please mention / link to America's Best Choice. Thanks! Posted by Bill Smith : Post Link --> 1:48 PM 0 Comments - Share Yours! 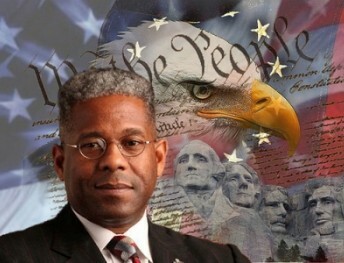 Rep. Allen West (R-FL) conceded defeat Tuesday to Democratic Patrick Murphy. While his congressional career has been temporarily ended, he will be back. He has been one of the strong voices for conservatism and tea party movement. He lost due to partly due to redistricting. Lt. Col. - Ret. Allan West has served two decades in the military and will remain a voice on behalf of conservatives. West said, “Just as I did in the deserts of Iraq and Afghanistan, just as I did on Capitol Hill, I will continue to fight for our republic.” Liberal wither do not understand that statement of hate West for being a black conservative. I look forward to continuing to support Mr. West. He is definitely is mo be a contributor on this site. Go West! Tags: Allen West, conceded, Florida, congressional race, US House, election 2012 To share or post to your site, click on "Post Link". Please mention / link to America's Best Choice. Thanks! Posted by Bill Smith : Post Link --> 2:39 PM 1 Comments - Share Yours! As Allen West Fights For His Political Life, Where’s The Cavalry? By Tom Tillison, Florida Political Press: As Allen West continues to fight for his political life amid a number of bizarre actions taken by St. Lucie County Supv. of Elections Gertrude Walker, a disturbing thought keeps creeping into my head. From the jump, West has been a prolific fundraiser and needed little help from the Republican Party structure in his reelection bid, which worked out well because that’s exactly what he got… little help. Despite being put into a much more difficult situation as a result of redistricting, courtesy of Florida’s Republican controlled legislature. Just as we saw with another Republican rookie lawmaker, Sandy Adams, who was literally forced into a no-win situation. Hmmmm… what are the similarities between West and Adams? He’s a man, she’s a women. He’s black, she’s white. Thus far, they seem to be polar opposites. But there must be something linking these two other than both being Republicans. I think I’ve got it! Each of these candidates were tea party favorites! Oh, and Allen West just happened to have endorsed Sandy Adams in her contest against Mica. By the way, did you catch what Republican Speaker of the House John Boehner said the other day when asked about the tea party? So Allen West’s political career is now in the hands of the St. Lucie County SOE, a woman that couldn’t explain to local media why her reports showed a 141% turnout (two ballot cards), who decides to recount votes at her discretion with little explanation. And to the surprise of no one, the media are inexplicably bored, other than waiting to officially declare West done. In the face of it all, Allen West stands alone, fighting for what is right, a fair and accurate election. Yet, where is the cavalry? Or will he be left alone in taking a stand in the face of what appears to very questionable behavior by local election officials? For Democrats, Allen West represents everything they stand against – a black conservative Christian that loves his country. So certainly it would be a big win to eliminate him. As for the establishment wing that controls the GOP, who often found the 2010 tea party class refusing to tow the company line, just how upsetting would it be to see West taken out? Or is that questioned answered when we ask where is the RPOF? The RNC? The NRCC? NRCC Chair Pete Sessions was certainly motivated to come to Central Florida during the 2010 election cycle, what does this race not have that compelled him to eagerly intervene in D24 two years ago? Or is that what grassroots conservatives can expect from the “heart and soul” of the Republican Party as we watch the Democratic Party build on their Franken collection? Tom Tillison is an integral part of the tea party movement in Orlando and an early critic of the bias in today's media. He's the original founder of the Central Florida Tea Party Council and Editor-In-Chief of the Florida Political Press. 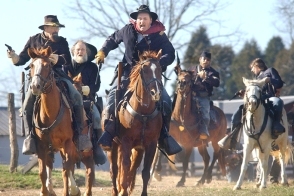 Tags: Allen West, Florida, 2012 election, US Congress, Where’s The Cavalry? To share or post to your site, click on "Post Link". Please mention / link to America's Best Choice. Thanks! Posted by Bill Smith : Post Link --> 1:34 PM 0 Comments - Share Yours! Vote for Connie Mack and for repeal of Obamacare! 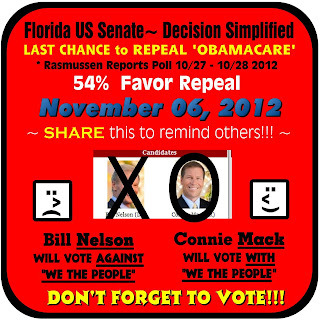 Tags: Florida, election 2012, Us Senate, Connie Mack, Bill Nelson To share or post to your site, click on "Post Link". Please mention / link to America's Best Choice. Thanks! NRCC: For generations, we've understood that with a little hard work, nothing was beyond our grasp. It's time we had a government that worked with us, and not against us. The "This is Our America" campaign shares stories from candidates and regular Americans around the country who are fired up about the 2012 election and have faith that America is bigger than it's challenges. We are the National Republican Congressional Committee, and our mission is to make sure Congress spends and taxes less, so the economy can get back on track. Rep. Mike Kelly: I really think this election is not just for control of our government. It's for the heart and soul of this country. And if we lose this now, we'll never, ever regain it. It'll be gone forever. Mia Love: For the first time, parents don't believe their children are going to have the same opportunities they've had. We are not better off than we were four years ago. Rep. Allen West: When I think about what kind of America I leave for my children and my grandchildren, I can't saddle them with this debt. I can't saddle them with a dependency society. Sean Hintze: We have to tighten our belts. I think that Washington has to do the same thing. Rep. Stephen Fincher: We're about individual freedom, we're about communities helping and taking care of one another. We want to grow the middle class. Give every opportunity to people to be whatever they want to be. Beverly Middaugh: I only ask for two things. Freedom and opportunity. Freedom and opportunity. With that, we can do worlds. Susan Brooks: I think that this election, is one of two paths. Do we want more government intervention in our lives, or do we want less? Fincher: Folks, this is the most important election of your lifetime. This is about restoring American, common sense, core principles back to each American. Giving you the opportunity to choose and decide what you want to be. Kelly: And on that day, November the 6th, there can be nothing that holds you up from getting from where you are to where you need to be to cast that ballot. Gov. Mitt Romney: I have a plan that takes advantage of the extraordinary opportunity that exists in America right now. That's going to get this economy going again and create jobs, jobs, and more jobs. We've seen the last four years. 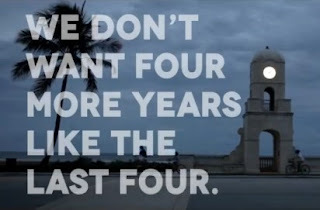 We don't want four more years like the last four. Kelly: We're going to fight. We're going to make sure we keep this America, this dream, this way of life alive for generations to come. It's incumbent upon us. It's not an option. This is one you don't walk away from. This is not a storm that's going to blow over. This is one you have to face head on. Tags: election 2012, Our Moment, Our America, NRCC, video, Vote, Mitt Romney, Aleen West, Vote Republican for Congress To share or post to your site, click on "Post Link". Please mention / link to America's Best Choice. Thanks! Your vote matters. Vote for religious freedom. Vote for 12 million new jobs. Vote for Mitt Romney. 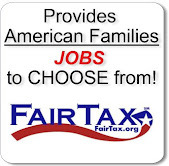 Tags: Florida, election 2012, jobs, religious freedom, Catholics, vote, Mitt Romny To share or post to your site, click on "Post Link". Please mention / link to America's Best Choice. Thanks! Posted by Bill Smith : Post Link --> 6:20 PM 0 Comments - Share Yours! WSVN-TV - FORT LAUDERDALE, Fla. (WSVN) -- A religious rift over a proposal to close school for Muslim holidays at a South Florida school district made tempers flare at a Broward County School Board meeting. The tension was high at the Broward County School Board meeting as a proposal from the Council of American-Islamic Relations to add two days off from school to recognize holidays for Muslim students was discussed Thursday night. "This is not about gaining a religious holiday in any means whatsoever. It is about inclusively, equality and diversity," said Ghazala Salam of the Council on American-Islamic Relations. The suggestion to add two days off detoured to a high religious debate and received heated responses. “That the group promoting and are asking for this is associated with terrorism," said Joe Kaufman, who opposed to the calendar change. Muslims making the request for two days off was backed by the Council on American-Islamic Relations. "The Broward County Muslim population as of 2011, is 47,765," said Salam. "The student population in Broward County is 17, 721." The committee debated whether to take the recommended two days off and designate them as religious holidays. "Change the language to vacation calendar and take the celebration out of it," said Diversity Committee Member Susan Yach. Though the meeting was extended to an additional hour, committee members were unable to come to an agreement. The Diversity Committee will ask the Calendar Committee to join them to come to a conclusion. Shared under the "Fair Use Doctrine for educational purposes. Embed code for video provided by WSVN-TV. Tags: Broward County, Florida, Islamic Holiday, vacation, WSVN-TV To share or post to your site, click on "Post Link". Please mention / link to America's Best Choice. Thanks! Posted by Bill Smith : Post Link --> 3:01 PM 0 Comments - Share Yours! Adam Hasner for US House - "Generations"
Tags: Adam Hasner, generations, 2012 elections, candidate, U.S. House, Florida, District 22 To share or post to your site, click on "Post Link". Please mention / link to America's Best Choice. Thanks! Posted by Bill Smith : Post Link --> 3:16 PM 0 Comments - Share Yours! 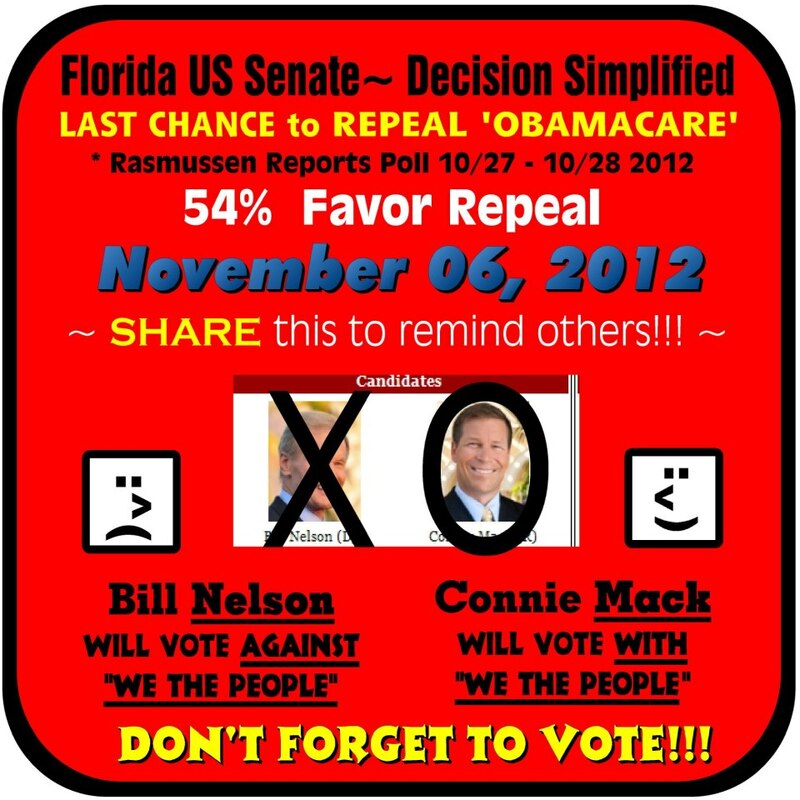 by For America: Florida Senator Bill Nelson case the deciding vote for Obamacare. He should not be returned to the U.S. Senate. We need to repeal and replace Obamacare. Tags: Barack Obama, Ben Nelson, Obmacare, To share or post to your site, click on "Post Link". Please mention / link to America's Best Choice. Thanks! Posted by Bill Smith : Post Link --> 1:02 PM 0 Comments - Share Yours!